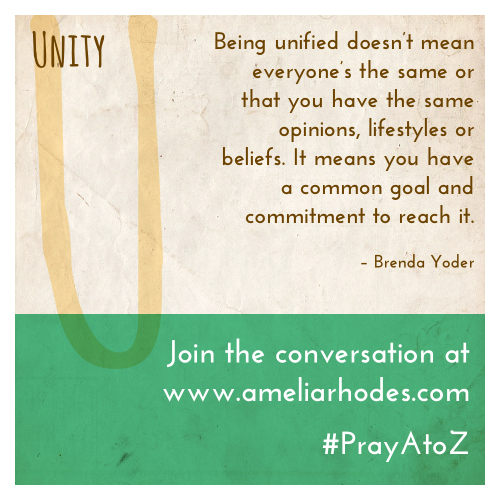 Today’s Pray A to Z post is brought to you by the letter U, for Unity. You can get caught up on the entire series here. You can download the free, printable prayer cards here. Brenda Yoder, a counselor and educator, shares with us today. As I write this post, the smoke’s still burning in Ferguson, MO. However, targeting Ferguson as a poor example of unity isn’t fair to the people living there. If we’re honest, any community could be that town – the one making national headlines for all that’s wrong when we don’t pray and engage for positive change in our towns and neighborhoods. I’ve noticed something as I’ve studied and taught local, state, and national history. We’re no longer the nation the Founding Fathers spoke about. We’re not a nation unified like we were during the Great Depression, World War II and the Eisenhower years. We’ve become a nation about me, I, and what works for me. You see neighborhoods and towns across the nation destroyed because of disconnectedness and fragmentation by race, economics, and religious beliefs. Being unified doesn’t mean everyone’s the same or that you have the same opinions, lifestyles or beliefs. It means you have a common goal and commitment to reach it. It means you work together to make things happen for the better good of the community. Beginning in your home or church with two, ten, or twenty people. Start with friends, church members, or parents from your child’s school. Reach across denomination lines and just get together consistently to pray for your school or neighborhood. Create a non-denominational worship event for your community. It could be for youth, women, men, or families. Set a date, get friends from other churches to help, and gather together in unified worship. If your town or neighborhood has separate holiday celebrations between churches, consider organizing a community event for one of the major holidays like Christmas, Thanksgiving or Easter. Contact your pastor or local ministerial association to begin the conversation, and start planning! A great way to build unity not only between churches, but to reach out to the unchurched. One event our community has is “The Big Give” where community agencies, businesses and service providers come together one Saturday in November and offer free coats, hair cuts, and other services to low-income families. Community agencies and other services providers have booths so they can share their services and information with families who may benefit from their resources, like the local food-bank, crisis pregnancy center, domestic violence agency, and other community providers. Talk to the pastors of your local churches or agencies to get an event started in your community! The enemy wants to seek and destroy our communities with disunity and conflict. What happened in Ferguson or other disenfranchised communities didn’t happen overnight or from one event. It took years of disconnection and anger building up over time. You can change that from happening in your community through prayer, relationships, and investment, making your community a positive place where people experience unity and sense of belonging. Make your community a place where “we the people” is living and active. Father, help me to see where I can be a catalyst for unity in my community and spheres of influence. Show me your broken heart over the broken-hearted, and equip me with prayer, strength, and leadership to make impact in my world. Amen. 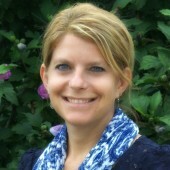 Brenda is a freelance writer and speaker with a Master’s Degree in Clinical Mental Health Counseling. She’s been a stay-at-home mom, teacher, and is currently a school counselor with a private practice. She was twice awarded the “Powerful Connection” award for teachers. She’s a parenting columnist for several online magazines, has been featured in Chicken Soup For The Soul, and will release first book, Magnified, Finding God’s Best In Busyness in 2015. Her ministry, Life Beyond the Picket Fence, can be found at brendayoder.com where she writes about faith, life and parenting beyond the storybook image. Brenda is a wife and mom of four children, ranging from middle school to college-age. Write down names of churches in your community, and pray for unity amongst them. Ask God to show you how you can begin to foster unity in your community. Pray for the tensions and conflict that may be brewing under the surface in your area. I really love this timely message. We really have become a nation all about ourselves. When we listen to others things really change. Amen to Relationships. Amen, amen, make friends, make friends.